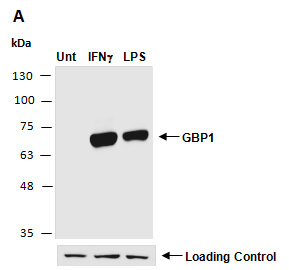 Rabbit polyclonal antibodies were produced by immunizing animals with a GST-fusion protein containing the C-terminal region of mouse GBP1 protein. Antibodies were purified by affinity purification using immunogen. for 20 hr as indicated, using anti-GBP1(C2) (R3725-2) at RT for 2 hr.